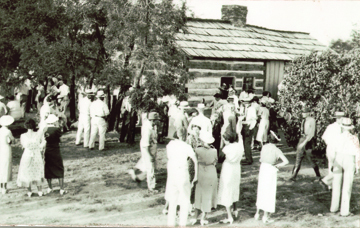 Once the Thomas Lincoln Cabin was completed, plans to dedicate Lincoln Log Cabin State Park began with a committee chaired by Benjamin Weir. Weir served as master of ceremonies at the dedication, which featured keynote speakers Edward C. Craig, Senior Counsel for Illinois Central Railroad; Patrick Barrett, WLS Radio; and Governor Henry Horner. After being called to a meeting with President Roosevelt in New York for the day before the day before the planned dedication, there was concern the governor would not make the ceremony, but Horner arranged with the president to meet early in the morning so he could make the 3:30 Thursday afternoon ceremony. A popular radio entertainer, Patrick Barrett played the role of Uncle Ezra on the WLS National Barn Dance radio show. On his show, Barrett, originally from Coles County, created a fictional city named Rosedale based on Charleston. Four men invited to share the platform, George Balch, T.J. Allison, Charles Freeman, and William Best, attended the 1861 gathering of Lincoln’s last visit at the Moore home in Farmington. The speakers thanked state leaders and National Park Service project superintendent Theodore Kingsbury, along with the enrollees of the CCC for their work. Newspaper accounts measured the number of attendees from 4,000 to 7,000 with over 1,800 automobiles from Illinois and neighboring states. After the ceremony, Governor Horner and his party attended a dinner at the CCC mess hall. Despite the fact that Lincoln Log Cabin’s development as a state park was not complete, the General Assembly made an appropriation for a park custodian in 1935. The job of custodian was a highly sought after position and the superintendent of state parks, George Luker, received several inquiries about the job, including one form Nancy Hall, one of the last descendants of the original owners of the property. Applicants had to pass a civil service exam, and being a member of the Democratic Party was very helpful. Plans to build a custodian’s residence on site meant the chosen applicant would live within the park. In December of 1935 Ivory Merritt obtained the position of park custodian at $1000 per year. He and his family moved into the custodian’s house in September 1936. As Lincoln Log Cabin’s first custodian, Ivory Merritt learned early in his tenure that state appropriations did not flow freely in his direction. His first summer at the park Merritt requested funds which would allow him to hire help cutting the grass, and was told there was no budget allowance for that. By 1939 Merritt was paying for help cutting the grass from his own pay. 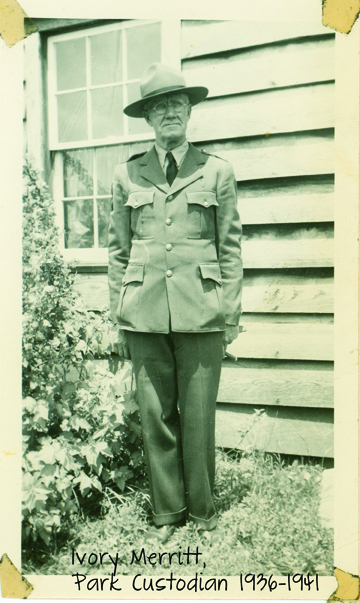 Always an advocate for the park and his community, he convinced the state parks director to allow a ball diamond for the CCC men and other organizations to play ball in the park. He successfully petitioned for the construction of a platform where groups could hold programs, the local DAR chapters being frequent presenters. He welcomed and supported local community involvement, acting as a liaison between the state parks department and the DAR to furnish the cabin. George Luker, director of state parks, received many inquiries regarding the job of concessionaire for the park. Merritt’s daughter Kathryn applied for the position and received the appointment in 1939. Luker informed her that the expected appropriation to build a concession stand was not approved but she could proceed if she wanted to fashion a counter herself. Kathryn studied biology and chemistry at Eastern Illinois State Teachers College and was teaching at Lerna when she received the job. She sold sandwiches and 10-cent sodas, cigarettes for 15 cents, a small ice cream cone for 10 cents, and was required to pay the state 10% of the gross receipts. Merritt’s wife Mary filled in when Kathryn was unavailable to work.